Ondrej Kase scored the go-ahead goal early in the third period as the Anaheim Ducks opened a four-game homestand with a 4-2 victory against the Chicago Blackhawks on Wednesday night. Brandon Montour, Daniel Sprong and Jakob Silfverberg also scored for the Ducks, who won their fifth consecutive game and improved to 7-1-2 over their past 10. Goaltender John Gibson made 25 saves. Kase broke a 2-2 tie at 4:03 of the third period, taking a long, cross-ice stretch pass from Carter Rowney to break down the right wing. Kase fired a shot over Crawford's left shoulder from the right faceoff dot. Silfverberg scored an empty-net goal at 18:29 to cap the victory. The Blackhawks had opportunities, hitting the post four times. Chicago's league-worst power play went 0-for-3. After trailing 2-0 following the first period, the Blackhawks tied it at 2-2 in the second. Gustafsson got the Blackhawks on the board at 7:16 of the period. Patrick Kane drove the puck along the boards below the goal line before shoveling a pass to Duncan Keith near the top of the left faceoff circle. Keith faked a shot and passed to Gustafsson, whose one-timer from the right faceoff dot beat Gibson to the near post. 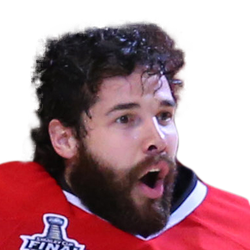 Chicago tied it at 19:32 of the second, as DeBrincat took a pass from Jonathan Toews and batted the puck just inside the left post from close range. Montour and Sprong scored 20 seconds apart early in the first period to give the Ducks a 2-0 lead. Montour put Anaheim on top at 5:41, floating the puck toward the net from the point. 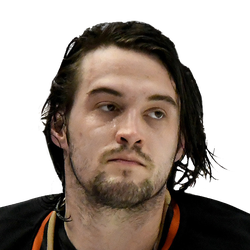 The shot found the upper left corner of the net as Crawford was screened by Rickard Rakell. Sprong made it 2-0 at 6:01, taking a banked pass off the boards from Adam Henrique down the right wing. Sprong, playing in his first game for the Ducks after being acquired Monday in a trade with Pittsburgh, nearly reached the goal line before firing a sharp-angle shot that made its way over Crawford's shoulder and into the far upper corner of the net. It was Sprong's first goal in 17 games overall this season.